There are certain combinations that just make sense. Cookies and cream. Bert and Ernie. Chips and Salsa. And Motorcycles and Charity. 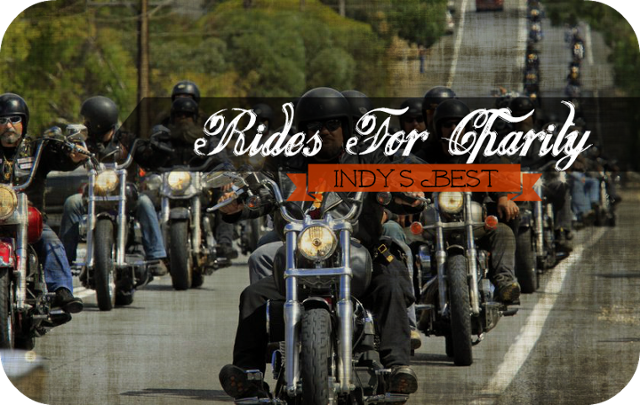 Every Summer, Indianapolis has a host of events featuring that very mashup and bikers riding for a cause will surely have the time of their lives. There are two different kinds: rides that go around a pre-determined route with various stops, and Poker Runs which are rides where riders get a card at each stop of the bike run and whoever has the best poker hand at the end gets a prize. It doesn’t matter whether you’re looking for a fun night out or just a leisurely ride, each of these events ensures that your money is well-spent on charitable causes. Here’s some not-to-miss charity bike events that you need to mark your calendar for in the coming year! If you’re looking for a great way to have fun and do some charitable work at the same time, you can join a poker run like the James Lee Rike Memorial Benefit Ride, which just completed its 6th ride this June. The event provides live band entertainment, a silent auction, a bike show, and prizes for the winning poker hand as well as the 100 mile scenic bike run. The poker run is in memory of James Lee Rike who passed away at young age of 9 due to a golf cart accident. At that time, his family did not have money for the funeral so the event was started to raise money. Today, the proceeds of the event go to the Indiana Dream Team, a non-profit organization that helps troubled youth reconnect with their family. Part of the earnings also go to the Children’s Death Benefits who assist families to pay for children’s funerals. You can find plenty of bike runs all across Indianapolis, all raising funds for charity. The RAMS Ride or Riders Against Multiple Sclerosis stems from Rod’s Ride and is open to all types of bikes and all kinds of riders. The RAMS Ride’s only objective is to raise awareness, money and support for their fight against multiple sclerosis. If you have a pet or are just an animal lover in general, you can always join the Ruff Ride Motorcycle Fun Run. The registration fee costs $35 and includes food, a shirt, as well as live music, casino cash, and many more. The Ruff Ride Motorcycle Fun Run is in benefit of the Pets Healing Vets & The Humane Society for Hamilton County. One of the biggest riding events in Indianapolis is the annual Rock for the Cure Ride to End Breast Cancer. Registration is at $25 for single riders and $35 with passengers as well as a $10 after-ride walk in. The whole day event includes free food and live music as well as a silent auction to raise money and field events that allows riders to show off their bike skills to that audience. The event is unescorted which means that riders can ride around the designated areas at their leisure. The event is in benefit of the Rock For The Cure Foundation Corporation which is a charity that aims to help the fight against breast cancer. To look for more info on these and other events throughout all of Indiana, visit this website!